You are a candy dealer in New York City in the summer of 2040 during the height of candy prohibition where candy is the new dope. Due to an obesity pandemic, a few years earlier the United States Congress declared sugar a highly addictive substance and banned the sale and manufacture of all candy. Your goal is to make as much money as possible in 30, 60, or 90, or 365 days without getting caught by the FDA or run out of town by the loan shark's thugs. 1. The basic idea of the game is to buy low and sell high. 2. 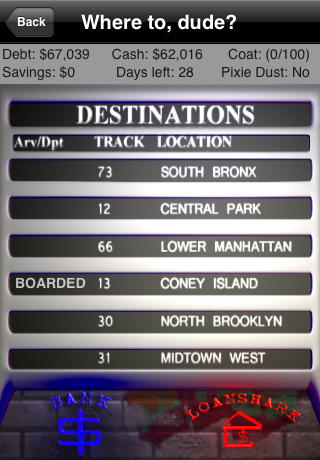 Travel between the various locations to find deals on the goods. 3. Sell when the price is more than you paid to make money. 4. Pay attention to the news flashes for really good deals (buy or sell). 5. Upgrade your trench coat when you can so you can carry more goods. 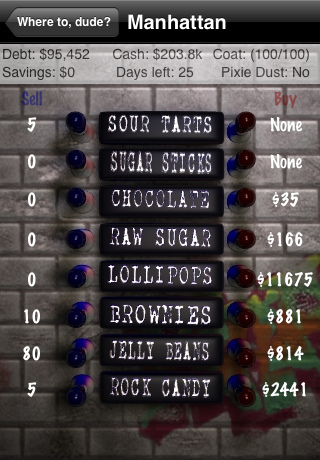 Added Game Center support for achievements and high scores so you can compare your candy dealings to your friends and others. The magical trenchcoat has been removed from the game, but we've added the ability to dump goods so you can make room in your coat if you find a good deal and all your pockets are full.